We Sell Bhut Jolokia from North East, India. We provide our customers Bhut Jolokia in Smoke Dried, Dry Pod & Powder forms.�We are Bhut Jolokia growers from Assam. As you would be aware that the Bhut Jolokia is a naturally occuring hybrid native of the Assam region of North�Eastern India. It is extensively cultivated in North Eastern Region of India especially in the states of Assam, Nagaland and Manipur. 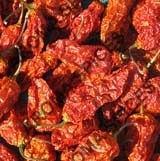 The Guinness World Records has recognized it as the hottest chilli in the world. We are one of the leading exporters�of Bhut Jolokia from Assam.